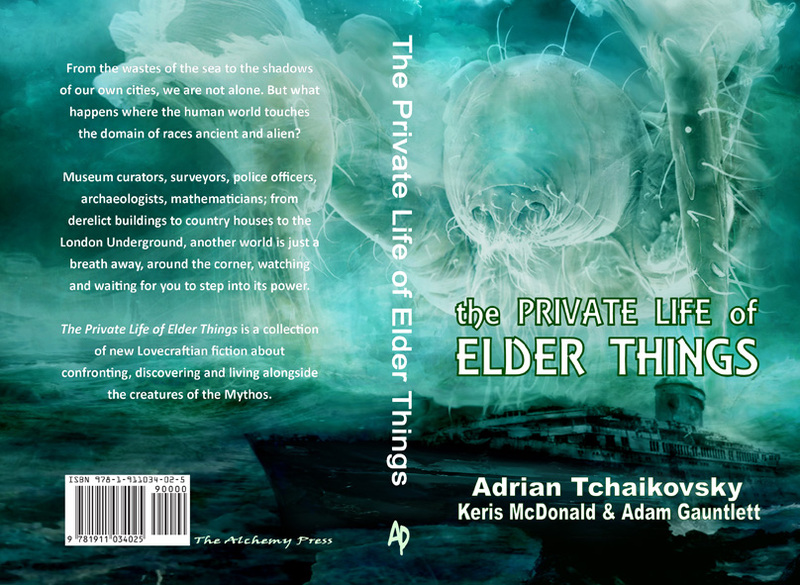 The Private Life of Elder Things is a collaborative collection / anthology by Adrian Tchaikovsky, Adam Gauntlett and Keris McDonald. From the wastes of the sea to the shadows of our own cities, we are not alone. But what happens where the human world touches the domain of races ancient and alien? Museum curators, surveyors, police officers, archaeologists, mathematicians; from derelict buildings to country houses to the London Underground, another world is just a breath away, around the corner, watching and waiting for you to step into its power. The Private Life of Elder Things is a collection of new Lovecraftian fiction about confronting, discovering and living alongside the creatures of the Mythos. The Private Life of Elder Things is available from Amazon and other online dealers. A Kindle version is also available. When H.P. Lovecraft write his first story, ‘The Call Of Chthulu’ in 1928, he was unaware of what he was unleashing onto the world of literature. His stories about the Old Ones, the Elder Gods, caught the imagination of horror writers the world over. Three are featured in this volume and their stories are the tip of the tentacle. Each approaches the theme in a different way. Notes at the back of the book give an indication of how the story fits with Lovecraft’s vision. Adrian Tchaikovsky lays claim to five of the stories in this volume, ‘The Private Life Of Elder Things’. In all of them there is an element of quest, in that someone is searching for something. In ‘Donald’ the title character is a nerdy and discredited marine conservationist whose finds, sent back to the narrator, indicate that not everything thought to be extinct is and the denizens of the deep are not pleased with humankind. The narrator of ‘Irrational Numbers’ is also a discredited nerd, but her speciality is numbers. While most of the academic world is laughing at her presumption in understanding a certain kind of numeric manipulation, she finds that an unknown someone or something appreciates her work and wants to hire her. The implication is that they are not human and might actually be members of the Elder Race. There is a similar scenario in ‘The Branch Line Repairman’, only this time the aliens are underground, discovered while digging part of London’s underground. In both the latter two stories, the creatures are assisted by human servants. ‘Season Of Sacrifice And Resurrection’ takes a slightly different direction. The narrator, the new curator of palaeontology, has a habit of working late. It is that habit that introduces him to Kevin, a refugee fleeing the past. Every year, Kevin’s fellows construct a machine which sends one of them back to find out if the enemy that drove them away is still extant. ‘Moving Targets’ brings another of Lovecraft’s horror tropes up to date, the idea that we share our world with monsters. Usually, people and monsters are unaware of each other but, when a youth disappears at a rave, it needs to be investigated. What is uncovered is very sinister. Adam Gauntlett doesn’t try to recreate the monsters Lovecraft is renowned for, instead he goes for the ambience of creeping fear many of Lovecraft’s stories generated. In ‘Pitter Patter’, a police team set up an observation point in a deserted TA centre. As members of the team start to disappear, the tension mounts. A building or at least part of one also features in ‘New Build’. As part of a renovation, a recently discovered room has to be cleared and cleaned. What the developers don’t know, until the bodies start appearing, is that by doing so they are letting loose a hound of Hell. His third story, ‘Prospero And Caliban’, brings together a number of themes, including the Shakespeare referenced by the title. Somewhere in one of the world’s oceans is a sea of weed that captures any ship that runs in to it. Sigurdsun has been marooned here a while and has survived by scavenging from other ships and avoiding the monsters that might want to eat him. When he discovers another survivor, an unspeaking American, he thinks he can build the resources to escape unaware of what lurks at the edge of the weed raft. The third contributor to this volume is Keris McDonald. In ‘Special Needs Child’, a woman’s desire for a child over-rides everything else. When Gina finds a child during the clean-up after Hurricane Katrina, she is able to overlook all the issues surrounding his upbringing. The fact that everyone else can see he’s a monster is irrelevant. ‘Devo Nodenti’ involves a different kind of monster. It’s not just the creature that only Peggy can see and that has fed off her dreams for fifty years but the man who used and caused her to invoke the demon in the name of justice. If there is a monster in ‘The Play’s The Thing’, it is probably Lithly House. It is an unusual structure as it keeps rearranging its rooms. Richmond is summoned to the house as the owner is unable to keep an inventory after an accident and several of the rooms appear to have gone missing. It is Richmond’s job to locate them.